Orange County Mayor Teresa Jacobs and Orange County Director of Health Services Dr. Chris Hunter hosted a Zika informational session with local commercial business owners to discuss ongoing mosquito control efforts and Zika preparedness in Orange County. Dr. Hunter gave an in-depth presentation explaining the Zika virus, how residents and visitors can protect themselves and what local businesses and homeowners can do to help prevent mosquito-borne illnesses. Zika is a virus that can be transmitted by two types of mosquitoes prevalent in Florida, the Aedes aegypti (Yellow Fever mosquito) or Aedes albopictus (Asian Tiger mosquito). The mosquitoes are day biters and are drawn to standing water in small containers – not lakes, rivers, ponds, etc. Orange County’s Mosquito Control field team works proactively to eliminate sources of standing water such as pool tarps, tires, buckets, empty flower pots and other small containers that can collect water. These efforts help eliminate the possible breeding grounds for mosquitoes. Eliminate standing water around your home and businesses and remove containers where mosquitoes multiply. Apply insect repellents containing DEET to repel mosquitoes. Consider wearing long sleeves, pants and socks when outdoors. Keep doors and windows shut. Cover windows with screens. Orange County Mosquito Control has a working laboratory where analysts examine, identify and log mosquitoes and larva found within the community. This information helps Orange County identify target areas for treatment and migration trends. Their efforts include removing standing water, which serves as a breeding area, providing research and information to partner agencies, and spraying communities to rid them of mosquitoes. The team has experience monitoring and combating various mosquito–borne illnesses such as the West Nile virus, St. Louis Encephalitis, Eastern Equine Encephalitis, dengue fever and the chikungunya virus. Earlier in August, Mayor Jacobs joined Congressman John L. Mica for a Zika Roundtable Discussion. The panel of federal, state and local elected officials spoke with community leaders and mosquito control officials about prevention, increasing funding and implementing educational programs for a proactive approach toward combating the Zika Virus. For more information on Zika, visit Orange County Government’s website, www.ocfl.net/zika. To download digital materials in English, Spanish, Portuguese and Creole, visit Orange County’s Zika Toolbox, http://bit.ly/ZikaOCFL. 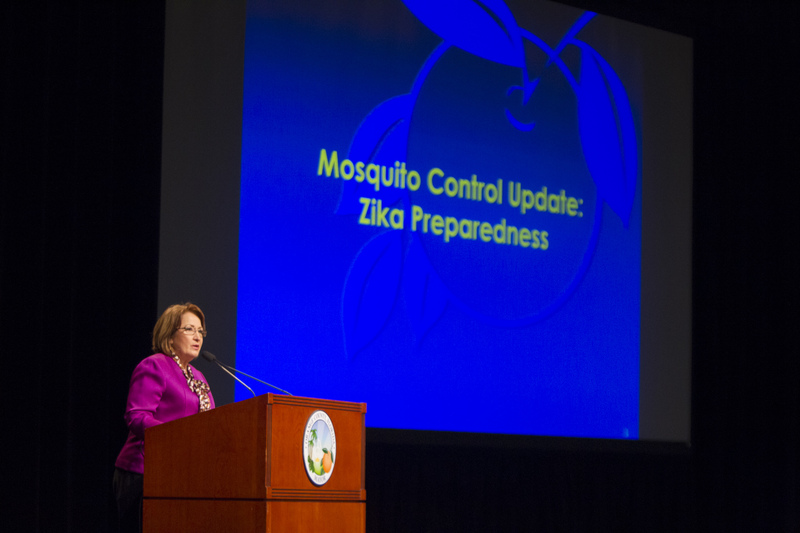 To view photos from the Zika information session, visit Mayor Jacobs’ Flickr album.